There are several ways to choose the right bouquet on our web. Either you can use the left side to pick a bouquet according to the occasion – To please somebody, A gift etc. The next option is to use the search engine above to type a kind of flower you are looking for. You will be displayed all combinations of bouquets, where the desired flower appears. These results will also be displayed after clicking on the time limited offer called “According to Flower Type“. The last option is to pick by colour by clicking on “According to the colour“ button. 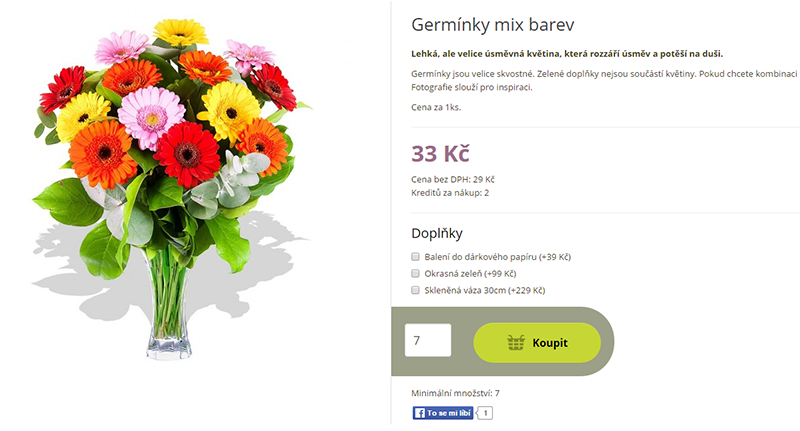 Once you have found the right bouquet, click directly on its name to see its content and gift accessories to be added (gift paper, vase or greenery). If you wish to add any of these, tick it off and add to your shopping cart by clicking on BUY button. It is important not to forget to read notes under each bouquet and flower. You will learn whether this flower is available in Prague only and other details. Next step is to choose a payment method. Payment via online card is preferred, because we are able to see this payment immediately on our account and your order can be delivered on the same day. While selecting payment via bank transfer, please remember that the transaction might take two days till the payment is on our account. We will only then be able to assign it to your order. 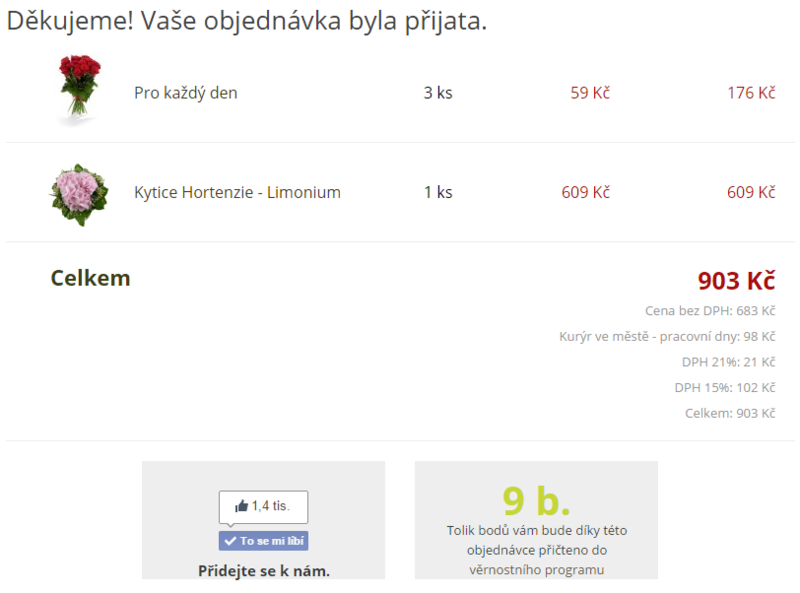 If you don´t have any another option but to pay via bank transfer and require same day delivery, please send us confirmation payment to info@kvetinyexpres.cz. Important warning: we do not accept confirmation from Česká spořitelna. If your payment is done via this bank, we are obliged to wait until the payment is on our account. Other payment methods are via online card, PayPal, cash on delivery or while taking delivery. Furthermore you will have a change to add your personal message – a card that will be attached to your bouquet. If you wish to add a longer message – a poem, a letter, feel free to send it to us in email, we will add it to your bouquet in a sealed envelope. Beneath the MESSAGE BOX you will find another box named ORDER NOTE. Write down here all information you wish to share with us to make the delivery easier, e.g. if the delivery is into hospital please write down whether the recipient is a patient, at what ward, room number, or the recipient is in a closed house, office number etc. In this box you may write down if you wish you to keep the colour of the flower (the one on the image) or you want a different one. Simply tell us everything we should know. If the good is out of stock, we will contact the customer immediately and look for solution. If everything is properly filled in, press the green “FINISH THE ORDER“ button in the bottom right corner. If you choose online payment by card, you will be automatically redirected to the payment gateway. In the case of a payment via bank transfer, all data will be sent to your email along with confirmation of your order. Troubles occurred and you are returned to a shopping cart and order form? Please, check again all filled data. Is a notification saying that given postal code is incorrect or that we don´t deliver to given address displayed? In this case, please contact us on + 420 605 295 636 or on our chat on our website. We will do our best to ensure the delivery. How do you know that your order was properly sent? Check your email box, after every successfully received order you will receive a confirmation email. All information given by you is discreet and will not be used by us anywhere. We deliver anonymously if that is what you require. The bouquet is wrapped into paper and a card with message is attached. The recipient is contacted only in the case that she/he is not present at the given delivery address. She/he is never said what kind of delivery is coming. If it is revealed, the recipient is deprived of the moment of surprise. It is possible to make a prior phone call with the recipient to arrange the delivery at given time and place. You, as our customer, will then receive a confirmation of delivery in an email. If the flower can not be delivered because the recipient is not present at given address, we will contact you, our customer, and arrange a repeated delivery. The flower is always delivered without invoice. Invoice is sent to you in an email immediately after the payment has proceeded. Come to pick up the flower yourself in our showroom, we only ask for previous agreement. Do you still have troubles and cannot complete the order? Contact us on + 420 605 295 636 or on online chat in the bottom right corner, available from 8 AM to 6 PM.